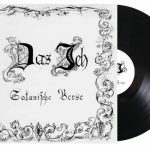 The latest album by Albin Julius’ Der Blutharsch and the infinite Church of the leading Hand gets a bigger distribution after being released in October last year. “What makes you pray” will be available later in March in 2 vinyl versions, a black vinyl version (you can place your orders here) and a limited red vinyl version (you can place your orders here) plus a CD version (you can place your orders here). To get an idea how the material sounds on this album, check out the track “Land Of Free” below in case you didn’t already hear the album.